A woman in China was killed in a tiger attack and another was badly injured while driving through a safari park. 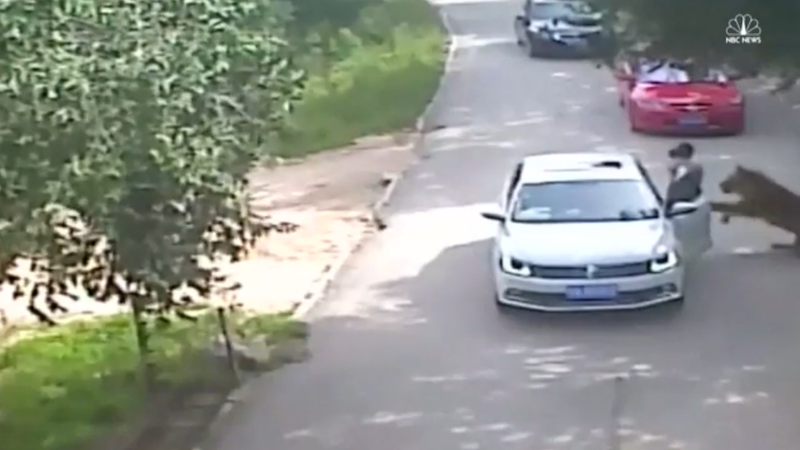 The attack happened at the Badaling Wildlife Park, when one of the passengers got out of the car in the middle of the road, reportedly after an argument with her husband, who was driving. (A family friend who disputes that report told the Beijing News there was no argument.) A child was also inside the car. In the video, a woman is seen getting out of the car and walking around to the driver’s side door when a tiger suddenly attacks her from behind and drags her off. The surveillance footage below shows the driver running behind his wife after the tiger drags her, leaving her with severe injuries. Another passenger who left the backseat—reportedly the mother of the woman who was dragged—was killed by another tiger. Neither the driver nor the child in the car were injured. The park reportedly has signs that advise visitors to lock their windows and doors while exploring. An investigation is currently underway.